Forget about frozen entrees and just-add-water meals; if you’re worried about your kitchen skills but want to give it a shot (or better yet – impress a guest with a homemade dish) you should always default to roasted vegetables. Hit your local farmers market or grocery store and buy an assortment of seasonal vegetables, picking diverse colors and shapes, plop them on a baking sheet with some olive oil and sea salt, and roast the hell out of them. Roasted veggies are a fool-proof and flavorful option that can be incredibly varied depending on the season. And maybe I’m biased, but there is nothing more beautiful than a multicolored platter of vegetables. This week’s dish developed out of haste; the weekend flew by and I found myself far from my apartment on Sunday and with a tiny window of time to grocery shop. I stood for a moment in front of the produce, debating the shoulder pains that would result from carrying too many items on the subway, and reached for a head of cauliflower. 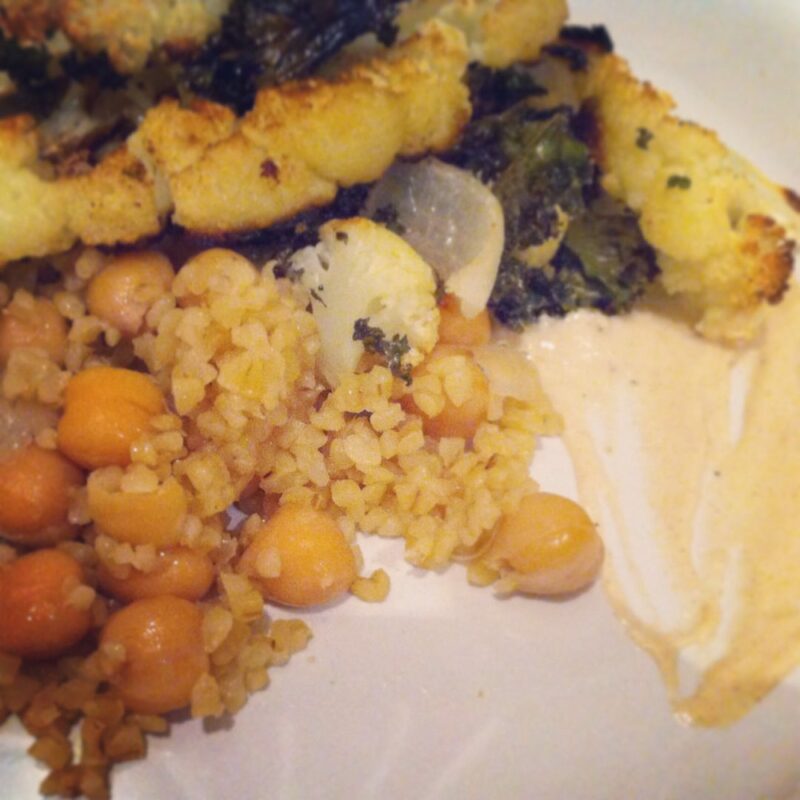 The resulting vegan dish combined a few leftover ingredients from previous posts with a big ol’ head of cauliflower. 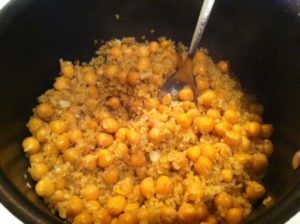 The bulgur chickpea combo is rich and savory, so much so that I found myself sneaking spoonfuls long after dinner was over. Pre-heat oven to 400 degrees. 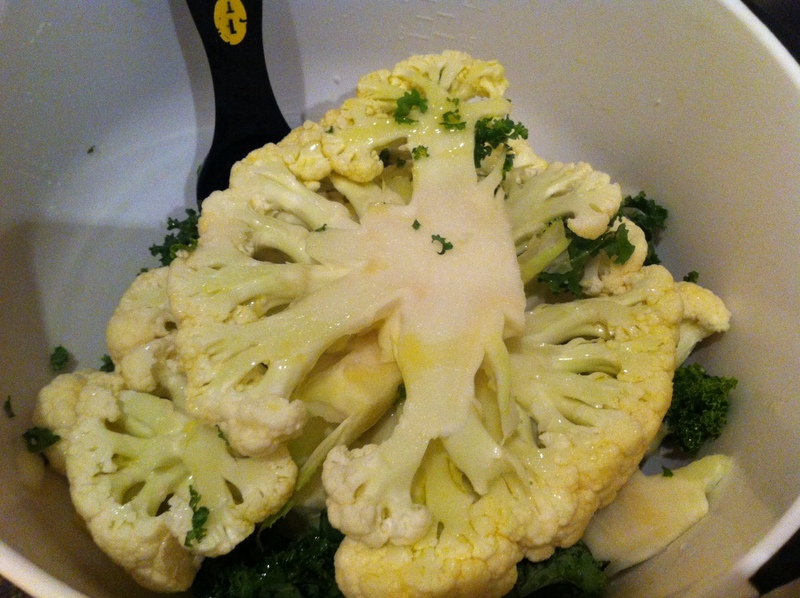 Using a large knife, slice cauliflower into long, thin, feather-like layers. You can also simply chop the cauliflower into florets. 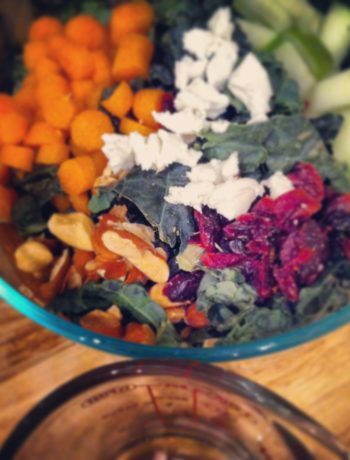 Add diced onion and cauliflower to a large mixing bowl (note: I also threw in the last handful of kale I had in the refrigerator because…kale). 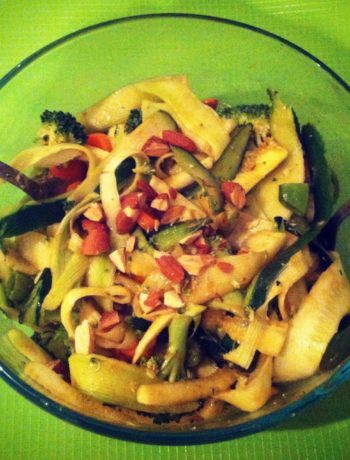 Add in two tablespoons of olive oil and mix the vegetables until fully and evenly coated. 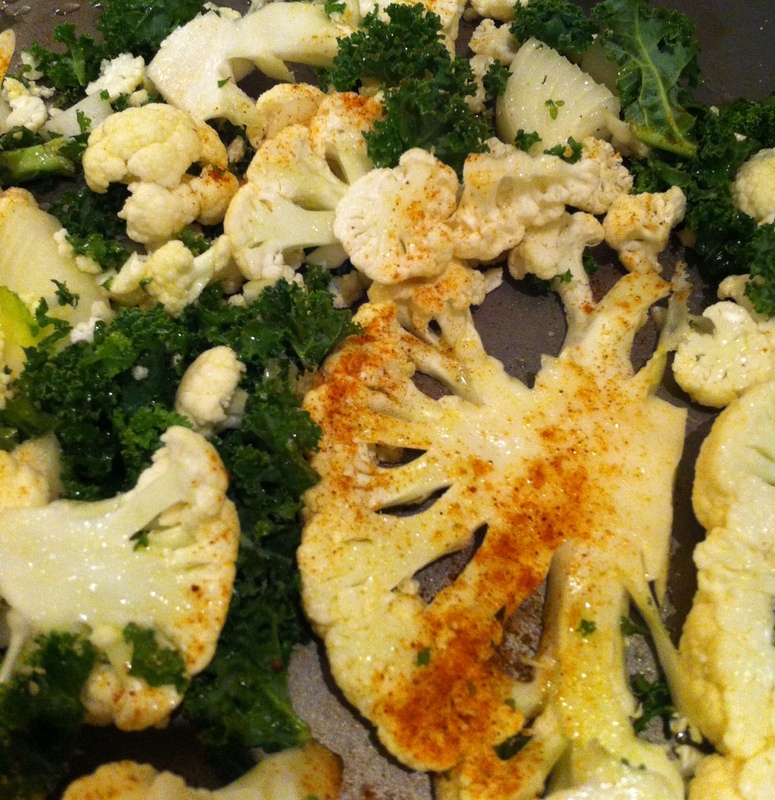 Dump the cauliflower and onion (and any other additional veggies) onto a large baking sheet and spread into a shallow and even layer. Top the vegetables with your spices. I added salt, garlic powder, cumin, and cayenne pepper. Pop the pan into the oven and leave them for 35-40 minutes or until the tips of the vegetables are browned and the cauliflower has softened. 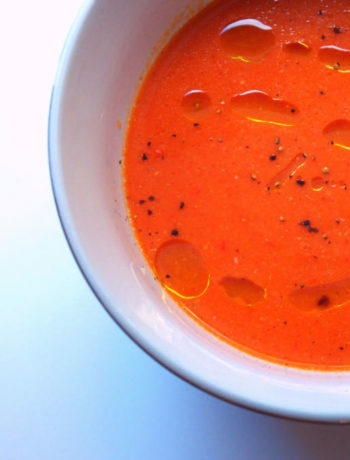 Meanwhile, add 1/2 a tablespoon of olive oil to a saucepan and turn on medium heat. 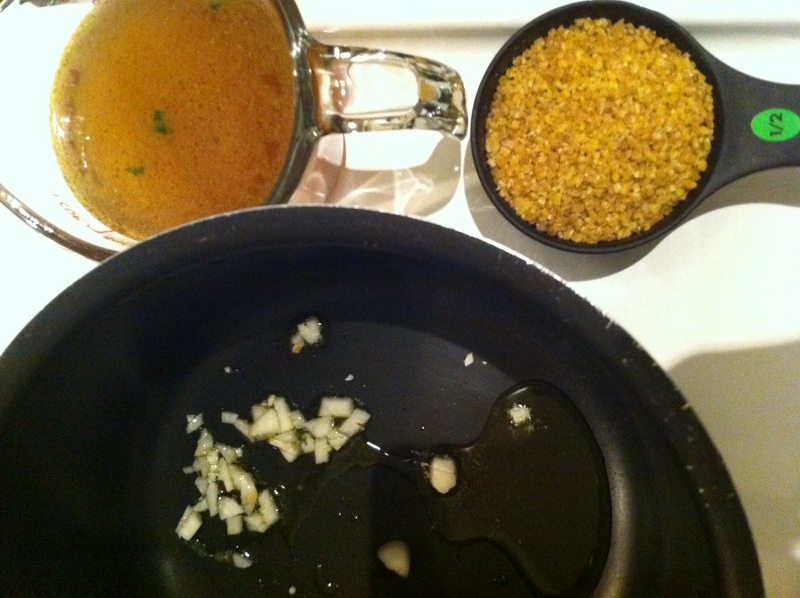 Add in the garlic and let simmer until golden, about 2-3 minutes. 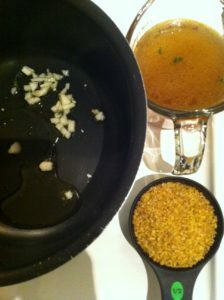 With the heat still on, pour in 1 cup of vegetable broth and a 1/2 cup of bulgur wheat. Watch the pot until the broth has begun to boil. Put the lid over the pot, turn the heat down to low, and allow bulgur to simmer for 10-12 minutes or until all of the liquid has been absorbed. Once the bulgur is finished cooking, remove from heat and add in the chickpeas, stirring thoroughly and covering with the lid to let the flavors combine. When the vegetables have finished cooking, remove from the oven and let cool for 5 minutes or until you’re able to handle them safely with your hands. In a bowl or on a plate, scoop out a bit of the bulgur and chickpea mix and top with mixed vegetables. 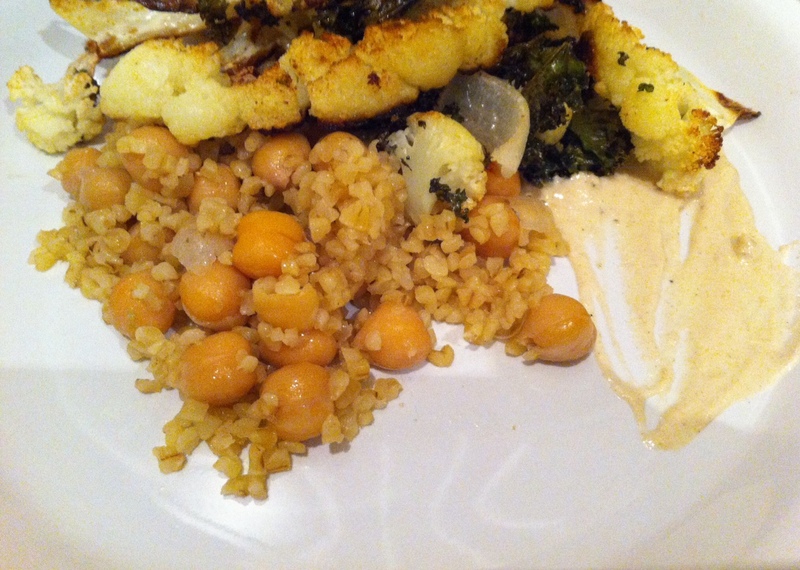 To add some creaminess, I plated my dish with some tahina sauce.